In a previous post I suggested that a London version of Bottom might well have indulged his passion for all things dramatic by attending a performance at the Globe Theatre. In order to understand this aspect of my research better I decided to replicate his journey and go to a performance at the reconstructed playhouse on the south bank of the Thames. It had become clear from previous research that the weavers tended to live just outside the old City walls so I chose the Liberty of Norton Folgate (near Shoreditch – home of two early playhouses, The Theatre and The Curtain) as my starting point (A on the map). The liberties were areas attached to the City but outside their direct jurisdiction; appropriately the Weavers’ Livery Company built six alms-houses there for poverty stricken workers in the early 18th century. The 2.5 kilometre walk (of course Bottom walked – he was a relatively poor working man) first took me past Spitalfields which was just starting to develop as the centre of the silk weaving industry – the foreign rivals who brought this skill to England were not popular with the domestic weavers. Also near here was the original site of the Bedlam madhouse (now Liverpool Street station). 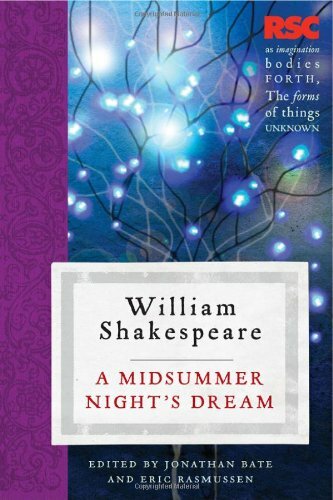 Bottom would then have entered the City proper through the Bishop’s Gate and into the parish of St Helen’s where Shakespeare is known to have lived during the 1590s – the time when A Midsummer Night’s Dream was written. The route then took me/us south across the eastern edge of the City towards the Thames. 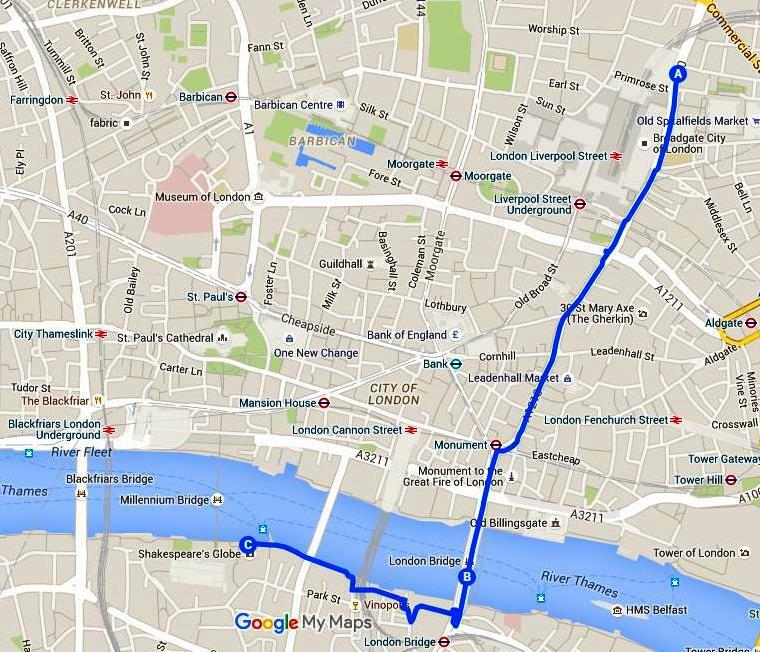 Those who could afford the 1d fare would have crossed the river by wherry (water taxi) but this would have been outside Bottom’s budget so London Bridge it had to be (B on the map). In Elizabethan times this was the only way of crossing the river on foot though it was not the present construction and had houses and shops lining both sides. Most imposing of these was the four-story Nonsuch House (as in “none such like it”), a prefabricated building constructed in the Netherlands and then shipped to England in 1579 to be rebuilt by the likes of Quince the carpenter and Snug the joiner. Once on the South Bank it was a relatively straight walk along through Southwark. In Bottom’s day this area was also outside the City’s jurisdiction hence the abundance of entertainment venues (bear baiting, theatres, brothels and taverns) of which the city elders did not approve. Interestingly the aforementioned wherrymen also vociferously opposed such places of entertainment being built inside the City as this would have removed a lucrative strand of their livelihood. And so to the Globe itself (C on the map). 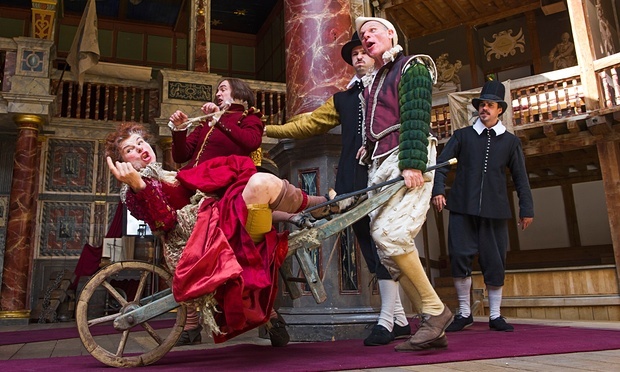 The theatre’s history and the story of its reconstruction led by American actor Sam Wannamaker (Zoe’s dad) is a subject far too large for this blog but there is plenty about it on the Globe Theatre website. Although approximately 200 yards from the original, with wider entrances and exits to accommodate modern fire regulations and, presumably, rather more hygienic toilet arrangements, it is in nearly all other respects a true facsimile and an impressive piece of reconstruction. The interior, particularly, gives a real sense of what it must have looked and felt like when Shakespeare worked there and if you’ve never been fortunate enough to go inside there’s a very helpful virtual tour you can see on the theatre’s website. 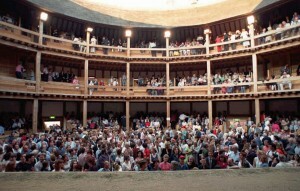 Although I have been to the Globe before (I recall a hugely entertaining Taming of the Shrew and a particularly unedifying Tempest with a miscast Vanessa Redgrave as Prospero) this had always been as a seated spectator. This time, following Bottom’s journey, it had to be as a “groundling”. I’d always supposed that this name was acquired because the audience members stood on the ground in the area known as the yard but apparently it was the Elizabethan slang name for a small type of fish. The yard audience became known as “groundlings” because from the actors’ viewpoint (five feet above the crowd) the audience could be seen gaping at them with mouths open just like a shoal of fish…. I shouldn’t be surprised if it didn’t also have something to do with the stench of so many unwashed bodies packed together (this, I hasten to add, was in Bottom’s day and not, fortunately, mine). So I paid the very reasonable ticket price (1d in Bottom’s day – £5 in 2015) and took my place for the 2.00pm start – exactly the starting time in the 1590s. The play was Measure For Measure not, it has to be said, the strongest piece in Shakespeare’s canon. Often known as a “problem” play it balances high drama with bawdy (in this case extremely bawdy) low life comedy. My own problem with it stems from the writing of the central female character; in my opinion it is all decidedly one note. Isabella’s tortured self-examination of her decisions makes for a character who comes across as whiny and miserable and although Mariah Gale gave it her best shot I still remain unconvinced. The comedy, however, was quite uproarious centring as it does around prostitution, drunkenness, criminals, innuendo and plain filth. These were earthy characters more in the vein of the Dream’s Mechanicals and the actors and actresses involved certainly knew how to work the crowd. Brendan O’Hea’s camp Lucio and Dean Nolan’s constable Elbow were particular hits with those of us in the yard. I thought it would be harder work standing than it actually was. The freedom to move around (rather than shift uncomfortably in a restricting seat) was quite liberating and as it was a pleasant, though not hot, day the 2 hours 40 minutes quite flew by. .A very interesting experience and one that gave me a greater sense of what Elizabethan playgoing was like and why Bottom would have found the acting lark quite so fascinating. I have to admit I bypassed the opportunity to walk all the way back to my starting point and instead continued down the South Bank to the National Theatre bookshop for a good old browse and to pick up a copy of the official Dream text that we will be using next year. While it’s a bit early to start learning lines yet, acquiring the text makes it all seem just that bit more real.